. As a coaching service, we are skilled at teaching others to coach well. Pete Carroll says, “Each person holds so much power within themselves that needs to be let out. Sometimes they just need a little nudge, a little direction, a little support, a little coaching, and the greatest things can happen.” In this series leaders learn to give constructive feedback that can be heard and acted upon. Strong coaches build winning teams! Participants will discover proper coaching behaviors and develop their personal beliefs as coaches. This workshop is the beginning of creating strong coaches. One of the greatest contributions a leader can make to an organization is helping the individuals on the team accomplish goals. Great managers understand that employees are in various stages of development and may require continuous coaching and feedback in order to develop the skills needed to meet designated goals. The purpose of this session is to assist your team in developing the necessary skills to coach others as they work to meet job expectations and goals. This session focuses on how to give feedback in a way that is descriptive, neutral, well-timed, and results in improved performance. Often we are not getting the results we seek because we are not asking the right questions. Knowing how to ask questions that result in critical thought, meaningful conversations, and action is a learned skill. This is the workshop to learn how to ask. We focus on distinguishing open-ended verse close-ended questions. We teach leaders to ask big questions that expand thinking, instead of small questions that focus on the task-at-hand. When we ask the right questions, we open the door to receive the answers we seek. Beginning from a place of curiosity and respect. Focusing on what you are hearing. This is the perfect workshop for organizations that are planning to undergo major change. Motivational interviewing (MI) is a person-centered counseling style for addressing the common problem of ambivalence about change. 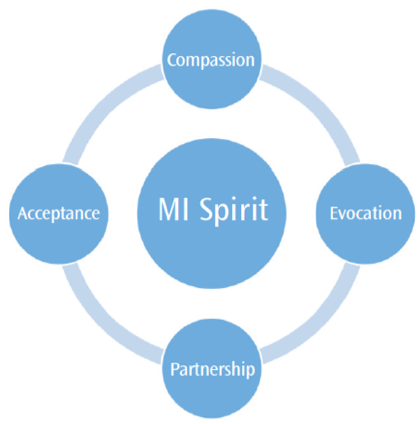 Motivational interviewing is an empowerment tool that is based in partnership, acceptance, compassion and evocation. This “how to” workshop gives participants tools and actionable steps to facilitate conversations that result in improvement, empowerment, and change! It has been over a decade since Dr. Spencer Johnson published the best-selling business book, Who Moved My Cheese? Using the five change management lessons to guide the conversation, this is the perfect workshop to accompany the “Motivational Interviewing” session. This customized workshop is ideal for a company that is undergoing change. Together, we will work to crate actionable steps to move from where you are, to where you’re headed.